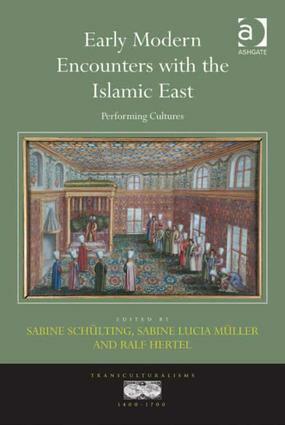 An exploration of early modern encounters between Christian Europe and the (Islamic) East from the perspective of performance studies and performativity theories, this collection focuses on the ways in which these cultural contacts were acted out on the real and metaphorical stages of theatre, literature, music, diplomacy and travel. The volume responds to the theatricalization of early modern politics, to contemporary anxieties about the tension between religious performance and belief, to the circulation of material objects in intercultural relations, and the eminent role of theatre and drama for the (re)imagination and negotiation of cultural difference. Contributors examine early modern encounters with and in the East using an innovative combination of literary and cultural theories. They stress the contingent nature of these contacts and demonstrate that they can be read as moments of potentiality in which the future of political and economic relations - as well as the players' cultural, religious and gender identities - are at stake. Contents: Preface; Introduction: cultures at play, Sabine SchÃ¼lting, Sabine Lucia MÃ¼ller and Ralf Hertel; Part 1 Players and Playgrounds: William Harborne's embassies: scripting, performing and editing Anglo-Ottoman diplomacy, Sabine Lucia MÃ¼ller; Performing at the Ottoman Porte in 1599: the case of Henry Lello, Gerald MacLean; Command performances: early English traders in Arabia Felix, Richmond Barbour; Strategic improvisation: Henry Blount in the Ottoman Empire, Sabine SchÃ¼lting. Part 2 Props and Costumes: English women in oriental dress: playing the Turk in Lady Mary Wortley Montagu's Turkish Embassy Letters and Daniel Defoe's Roxana, Susanne Scholz; Painting the 'orient'? Dosso Dossi's Melissa, Wibke Joswig; Materialising Islam on the early modern English stage, Matthew Dimmock. Part 3 Encounters on Stage: Ousting the Ottomans: the double vision of the East in The Travels of the Three English Brothers (1607), Ralf Hertel; Claudio Monteverdi's Combattimento di Tancredi e Clorinda (1624 or 1625): a Christian-Muslim encounter in music?, Clemens Risi; After Orientalism? Post-September 11 culturalisms at play in Bambiland and The Persians, Claudia Breger; Bibliography; Index. Sabine Schülting is Professor of English Literature and Cultural Studies at the Freie Universität Berlin, Germany. Sabine Lucia Müller is currently employed as director's assistant at George Eckert Institute for International Textbook Research in Braunschweig, Germany. Ralf Hertel is Professor of English Literature at the University of Trier, Germany.